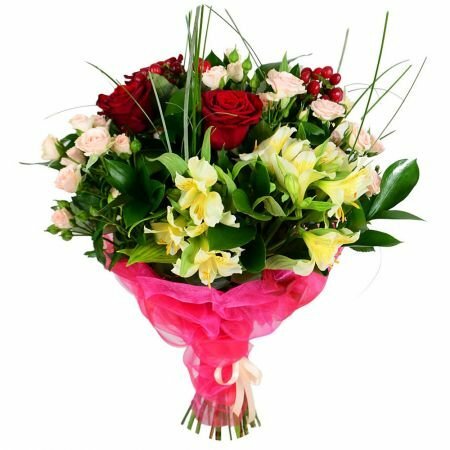 Holiday Bouquet of wishes - flowers delivery in Ukraine! Rose red(3 pt. ), Hypericum red(3 pt. ), Alstroemeria white(3 pt. ), Rose spray pink (2 pt. ), Greens(1 pt. ), Beargrass(1 pt. ), Packing(1 pt.). 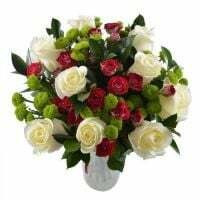 Birthday, Business, Colleague, Compositions, Daughter, For grandmother, For her, For him, For mother, For young lady, Girlfriend, Gratitude, I Miss You, Mother-in-law, Sister, Teacher, Wedding Day, With love, Аnniversary. Holiday Bouquet "Best Wishes" supersede any, even the kindest words. 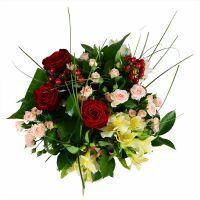 Our florists in the preparation of this composition, did everything to make the most sincere congratulations. This bouquet was the epitome of the holiday - no doubt, he will certainly be the most memorable and will take place in the best vase in plain view! 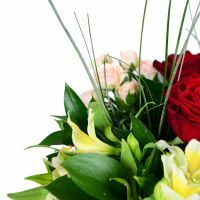 Luxury holiday flowers have become the heart of this composition - bright red rose, scarlet hypericum, alstroemeria white, tender shrub rose and herbs that complement the splendor of this chord freshness. Do not hesitate! 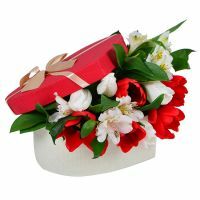 Presented this charming flower greetings - rest assured, no one will doubt the sincerity of your gift. To whom and when to give this product? It is obvious that this song can not be called "daily" - it is worthy of only the most important holidays. 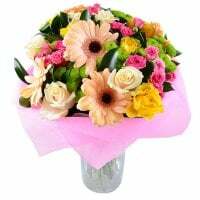 Birthday, promotion, Christmas holidays, March 8 - that's motives to which this bouquet is appropriate. Manager response: Thanks for such lovely feedback! We do our best to make hppy you and your dearest people! Hope to fulfill your next orders! 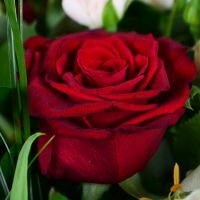 I have not received the flowers yet ! I have not received an E-Mail. Please check my email address ! My email adress: steffen.leiser@marquardt-kuechen.de . I expect the goods today. Manager response: Thank you for your second order! Have a nice day! Manager response: Sunil, thank you for your 5 orders on our company!